(1960) Kirk Morris, Laura Brown, Alfredo Zammi, Frank Leroy. 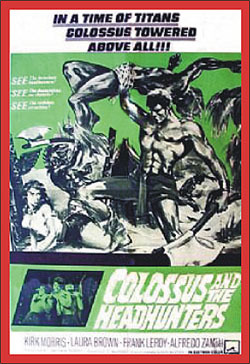 The mighty colossus flees to tan island after escapein a deadly earthquake. There, he finds himself battling a ferocious tribe of headhunters as he tries to save a dethroned queen. One of Morris' better sword & sandal efforts. AIP color. 16mm.